Cartilage is a tough but flexible tissue that is the main type of connective tissue in the body. Around 6580% of cartilage is water, although that decreases in older people, and the rest is a gel-like substance called the matrix that gives it its form and function.The matrix is highly organised and is formed of several types of protein called collagens, proteoglycans and noncollagenous proteins. Specifically, proteoglycan and noncollagenous proteins bind to the collagen meshwork. Water, which is attracted by negatively charged glycosaminoglycans, fills the molecular framework. The matrix is produced and maintained by a group of cartilage cells embedded inside the matrix called chrondrocytes, which originate in the mesenchyme, a meshwork of connective tissue in the embryo. The volume of cells in the cartilage is small, making up about 1%2% of the tissue volume in adults. Cartilage contains no blood vessels (avascular), no nerves (aneural) and no lymphatic system (alymphatic) and nutrients have to diffuse through the matrix. There are three main types of cartilage: hyaline, elastic and fibrous. They have different properties that correspond to their specific functions in the body and make it the most appropriate type of cartilage at that particular site. 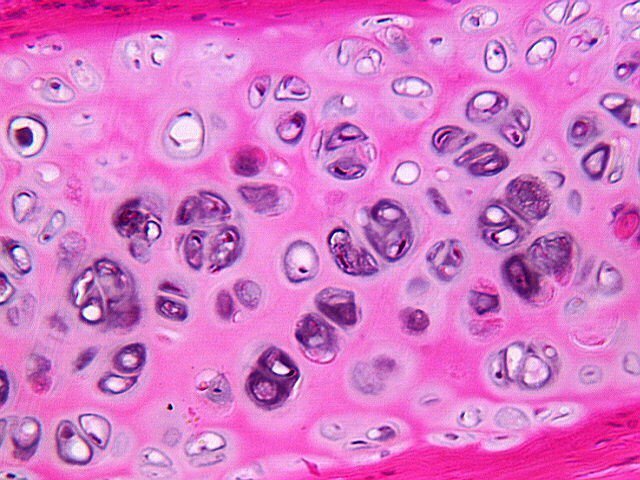 Hyaline, or articular cartilage, is found in the joints, septum of the nose (which separates the nostrils), and the trachea (air tube). Elastic cartilage, which has elastic fibers that make the cartilage more flexible, is found in the ear, part of the nose and the trachea. Fibrous cartilage occurs in special cartilage pads called menisci that help to disperse body weight and reduce friction, such as in the knee. In the joints, hyaline cartilage forms a very low friction, 3-5 mm thick layer that coats the boney surfaces. This allows the bones of the joint to glide over one another during movement and, ideally, last a lifetime. It also serves as a cushion and shock absorber in the joint.  If cartilage of the ear or nose is involved, cosmetic problems might result. Articular cartilage can be damaged through accidents, such as a tear to the anterior cruciate ligament (ACL), or degenerate slowly over time, eventually leading to osteoarthritis. 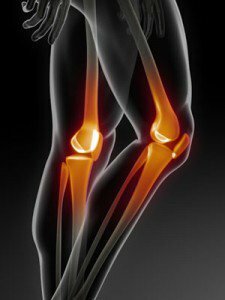 Poor alignment of the joint, excessive weight, excessive activity, overuse, or injury can all cause cartilage to wear away. If the cartilage is damaged or worn, the joint becomes painful and stiff, and with reduced range of movement. In severe osteoarthritis, the hyaline cartilage can completely wear away, leaving the affected joint without its cushion. This causes the bones to rub against each other. Osteophytes, or bone spurs, may also form at the margins of the joint due to the extra stress on the ends of the bones. This leads to significant pain, loss of movement, and poor function. The damage can start as a local pothole in the cartilage  called a cartilage lesion. When a lesion is left untreated, it will most likely enlarge over with time until all the surrounding cartilage is worn away. Since cartilage has minimal ability to repair itself, even small lesions, if left untreated, can cause deterioration to the joint surface and lead to osteoarthritis. It is therefore important to diagnose a cartilage damage as early as possible and have it treated. On this website we are focusing on articular cartilage repair treatment, which means the restoration of damaged hyaline cartilage in the joints. Cartilage repair and regeneration are treatment options for joints that have damaged cartilage but are otherwise healthy. The choice of procedure depends on the size and location of the defect. Larger defects are typically treated with autologous chondrocyte transplantation or osteochondral allograft transplantation, both of which require open incisions. Smaller defects in specific locations can be treated with marrow stimulating techniques, autologous chondrocyte implantation (ACI), or osteochondral autograft transfer. As in all joints, the ends of the bones are covered with hyaline, or articular, cartilage that protects the ends of the bones and allows them to glide over each other during movement. Loss of this cartilage can lead to osteoarthritis. The knee can also be seen as consisting of two compartments, one on the inside of the knee (medial) and one on on the outside (lateral). Each of these contains a meniscus, or pad of more fibrous cartilage, that acts as a shock absorber and helps to stabilise the knee. The two cruciate (cross-shaped) ligaments are found at the centre of the knee and stop the tibia moving too far forwards or backwards, while the two collateral ligaments are on the inside and outside of the knee and help attach the femur to the lower leg bones. If any of these ligaments are injured, the knee can become unstable. In the patellofemoral joint, the kneecap moves in a groove on the femur called the trochlea, and both sides are covered in articular cartilage that eases movement. Above the knee, the quadriceps (four-headed) muscles of the thigh help to straighten the knee and stop the tibia moving backwards, while the hamstring muscles, at the back of the knee, help to bend the knee and stop the tibia moving too far forwards.